SCOTCH PLAINS — In the sunroom of his home in Scotch Plains, retired U.S. Army Reserve Lt. Colonel Bernardo Canete flipped through a coffee table book titled “100 Wonders of the World,” stopping at the table of contents where check marks appear next to the destinations he and his wife have visited. Among them: Angkor Wat in Cambodia, the Hagia Sophia in Turkey, Petra in Jordan and the Wailing Wall in Jerusalem. Scotch Plains resident Teresita Canete spent her last three years fulfilling her dream of world travel. She’s seen here at the Egyptian pyramids. Diagnosed with cancer in 2002, the disease progressed and she died on Nov. 24. Three years ago, facing a terminal illness, Teresita Canete quit her job, and she and her husband embarked on a quest to visit as many of the world’s great landmarks as they could. Before she died last month, she managed to see more than a dozen on four continents. “Her goal was to hit all these places,” said Canete. Teresita Canete died on Nov. 24 at age 63, after a seven-year battle with endometrial cancer. 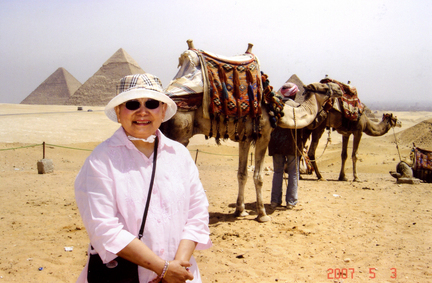 A native of the Philippines, Teresita had nurtured a lifelong love of travel. But likely knowing her time to see the world was limited, she retired after almost 30 years as a nurse with the Veterans Administration in 2006 and began chemotherapy treatments. Soon after she retired, Teresita, Bernardo and their two children went to Machu Picchu, an ancient Inca city nestled in the mountains of Peru. As the chemotherapy progressed, her hair fell out, but that didn’t stop her from catching a flight to exotic destinations with her husband in between treatments. Teresita was influenced by the spirit of the author Jack Kerouac and said life without travel is only half-living. “She just wanted to travel and do all of the things she always wanted to do,” her son, Rodney, said. One of six children, Teresita was born on June 12, 1946 in Cebu, Philippines. An avid reader, she cultivated her passion for learning and travel through literature. She obtained her nursing degree in 1968 and came to New York City three years later on an exchange program for health care professionals. The same year, her husband immigrated from Cebu in the Philippines. They married in 1973 and later had two children, Rodney and Rachael. She earned a master’s degree in nursing from NYU and later joined the Army Reserves, where she served 21 years before retiring in 2005 with the rank of major. Every year, she led her family on a trip. They visited the Caribbean and Europe and drove across the country in a van for two weeks. But in the last three years of her life, the trips she and her husband took became more frequent. Because of personal and cultural reasons, Teresita was private about her illness. Friends and co-workers she knew for decades didn’t know she had cancer. But close friends had their suspicions she wasn’t well. Her last trip was a cruise from New York to Nova Scotia over the summer. She had plans for a January trip to the Philippines and Malaysia. But, on Nov. 12 she checked into the hospital for complications of her illness, and almost two weeks later, she died. At the time of her death, she had checked off 46 sites in the coffee table book, a Christmas gift from her son. For now, her husband needs time before he considers continuing her quest to see all 100 of the wonders on the list. © 2009 NJ.com. All rights reserved. Thomas Quirk’s voice cracked as he recalled the horrific suffering of his wife of 39 years, his “Irish colleen,” in the months before her death from a perforated bowel — the result of medical negligence. On Wednesday, the retired police officer and his two sons settled their wrongful-death lawsuit in Cook County Circuit Court against Little Company of Mary Hospital and two other entities in the 2004 death of Patricia Quirk, 60, a mental health expert who advocated for mental health services in Chicago and at the state level for more than 15 years. The West Lawn family’s $7.5 million settlement with the hospital, her doctor, Vera Petras, and Radiation Oncology S.C. set a Cook County record for a settlement in a wrongful death of an adult with no minor children, according to their lawyer. “She was chairperson of all 19 community mental health advisory boards in the city of Chicago. She’d work 60 hours a week sometimes, and it was all volunteer work,” said Thomas Quirk, 69. After Patricia Quirk was diagnosed with stage three endometrial cancer, she began radiation therapy at Little Company of Mary on March 26, 2003. The first 11 treatments went fine, according to the suit, then she was overradiated — 17 times — which ultimately perforated her bowel and caused a bacterial infection in her blood and her death. Hospital officials could not be reached for comment. “It’s about making sure this never happens to anyone else,” Thomas Quirk said. Funding his terminally ill sister’s cancer treatment, Francisco Peinado got plundered by credit card debt and endless collection calls. However, a sympathetic debt relief program rescued the victim of unemployment and mountainous medical debt from becoming a casualty of medical bankruptcy, which based on a New York Times article, is growing. (PRWEB) January 10, 2010 — After the news from the Debt Free League financial adviser, Francisco Peinado basked in a bittersweet moment. He painfully reminisced of his sister’s arduous bout with cancer. Yet, December 30, 2009 marked a remarkable accomplishment. He was debt-free. Peinado, a new graduate of the National Debt Relief Stimulus Plan (http://debtfreeleague.com/our_guarantee.html), initially joined the debt relief program somewhat skeptical. Unable to find the right solution to his debt, he had spent two torturous years gasping for air. First, he lost his job of 15 years. The unforeseen event put his finances on the rocks. Whatever employment he found was unsuitable for his financial obligations. For the past two years, he waited on tables as his income kept fluctuating. Paying the bills grew tiresome. Although he paid on time, pleading with creditors to lower his interest rates wasn’t working. They just slammed their doors, stating they couldn’t help. His situation needed urgent attention. Then, came the icing on the cake… He made the difficult decision to incur more debt by funding his terminally ill sister’s cancer treatment. It dragged Peinado $21,819.19 deeper in credit card debt. Like most bankruptcy (http://debtfreeleague.com/bankruptcy.html) filers, he was unable to pay the medical bills. Illness or medical bills contributed to 62.1% of all bankruptcies in 2007, according to an American Journal of Medicine study. A New York Times article also indicates the amount of personal bankruptcies due to illness, is growing. The actual growth remains a mystery since medical bills are frequently camouflaged as credit card debt. Confronting the dilemma of rampant medical debt (http://debtfreeleague.com/medical_debt_reduction.html), the Obama administration pushed for reform to make health care more affordable. But, until a bill is passed, those with insurmountable medical debts will continue their pilgrimage into bankruptcy court. After a phone consultation with a Debt Free league financial adviser, Peinado decided a different path. He chose the debt settlement (http://debtfreeleague.com/debt_settlement.html) company’s unique bankruptcy alternative, which helps consumers and small business owners throughout the country overcome severe financial hardships like his. Peinado felt comfort from the San Diego-based organization’s community involvement. Their personnel volunteered with aid during the 2007 San Diego wildfires, and are active participants with various charitable causes, such as the fight against AIDS, Leukemia, and domestic violence. The company also offered Peinado the possibility of a much greater savings than credit counseling (http://www.debtfreeleague.com/consumer_credit_counseling.html). Plus, they allowed him to enroll his medical bills. The debt had been piling up since 2007 when his sister was diagnosed with uterine cancer. Her financially and emotionally-draining illness changed his life. Uterine cancer, also referred to as endometrial cancer, is the most common gynecological cancer in American women. 35,000 new cases are reported each year. The cancer, which grows in the muscular wall of the uterus, is curable with early detection. However, doctors detected her cancer at a late stage. Abnormal cells had metastasized beyond her lymph glands into her fallopian tubes. Thereafter, cancerous growths invaded most of her body. She eventually passed away, leaving Peinado independently fighting with substantial credit card debt (http://debtfreeleague.com/faq.html) and belligerent debt collectors. Each day, Peinado mourns his sister’s passing. But is hopeful that time will take away the pain. For now, he has no more worries about creditor harassment, or his debt. “To date, my sister’s death bears a heavy burden on me. But that’s destiny. My real outrage was the heartless debt collectors and their collection calls. If it weren’t for the National Debt Relief Stimulus Plan, the irritable stress would have pushed me into bankruptcy,” declares Peinado. He figured he’d get out of debt in the course of twenty eight months, as the program initially estimated. Yet, he jovially achieved financial freedom in 12 months. Starting the 2010 New Year, the organization continued strong, aiding people to improve their financial misfortunes. For one client (whose name was omitted due to confidentiality), they were able to settle an $18,878.96 Chase Bank credit card balance for a debt total payoff of $2,831.84. The 14 percent settlement represents a monumental achievement for the debt settlement industry (http://debtfreeleague.com/our_company.html), where the average client saves 50 percent. The $16,047.12 the program saved can be a major life improvement for anyone living paycheck-to-paycheck. On the reverse, by continuing the minimum payment, a cardholder can be enslaved for many years, repaying as much as triple the original balance, over $56,000. Debt Free League (http://www.debtfreeleague.com/) is the pioneer of the National Debt Relief Stimulus Plan. The debt settlement organization employs in-house, debt negotiation specialists. Their professional debt arbitrators help consumers and small business owners resolve financial hardships via negotiation of personal, medical, and business debt settlements. Free phone consultations are available by calling the company’s hot line at (800) 213-9968. They also provide bilingual services through their Spanish affiliate, Libre de Deudas (http://www.sealibrededeudas.com/). Disclaimer: If you have any questions regarding information in these press releases please contact the company listed in the press release. Please do not contact PRWeb®. We will be unable to assist you with your inquiry. PRWeb® disclaims any content contained in these releases. Our complete disclaimer appears here. © Copyright 1997-2008, Vocus PRW Holdings, LLC. Vocus, PRWeb and Publicity Wire are trademarks or registered trademarks of Vocus, Inc. or Vocus PRW Holdings, LLC. This section is a place to share stories about Living with Endometrial Cancer. Below are entries of those who have already shared their stories. We hope that you find their experiences helpful to your own situation. You may also Help others by sharing your story. Tom Devine, 56, has felt scared to death twice in his life. The first time, he was 19, crammed in a plane bound for Vietnam with other jittery young soldiers who camouflaged their nerves with banter and bravado. Recurrences: Three. Devine has been free of cancer for the past seven years, his longest remission since the original diagnosis. The second time was 20 years later. Devine was a 40-year-old husband and father living in Flint. Tanned and fit, he was sitting on a paper-covered table in an examining room, awaiting news about what he’d once been convinced was a nagging gallbladder. But it wasn’t his gallbladder. It was cancer. Devine had surprised himself by surviving his tour in Vietnam, despite a bout of malaria and injuries sustained when he drove a tank over a land mind. His next tour of duty was with non-Hodgkins lymphoma, an immune-system cancer that strikes more than 71,000 Americans each year. Survival rates vary by type and stage. Devine’s cancer was advanced. It was diagnosed as late Stage Three, within shouting distance of the fourth and final stage. By the time of his diagnosis, a large mass had a strangle-hold on his esophagus and aorta. Devine was “fighting the war all over again,” he said. But he had a lot to fight for. Free help 24/7 At the American Cancer Society’s free help line, trained cancer information specialists are available 24 hours a day, seven days a week to answer questions about cancer, link callers with local resources, give information about local events and provide emotional support. Each year, staff members at the help line personally respond to more than 1 million calls and e-mails from patients and family members. If you have questions, call (800) ACS-2345 or visit http://www.cancer.org. Devine underwent six months of rigorous chemotherapy. An electronics engineer, he scheduled his treatments around his work schedule.But 44 weeks of daily radiation therapy forced him to quit his job. While his wife, Donna, was at work and his daughter, Jenny, was at school, Devine was often home alone with too much time to brood. Chemo and radiation caused hair loss, vomiting, depression and fatigue. But they did the job. The cancer retreated. When CAT scans could no longer detect any sign of the disease, Devine was given an indefinite furlough. He need only report back for checkups every three months. Life returned to normal, but it was never the same. Devine never again took for granted a kiss from his wife, a hug from his daughter, a walk with his dog. He lived in a state of heightened appreciation – until a week before each checkup. Devine had 2 1/2 years of celebrations before he heard the words he dreaded: the cancer was back. Devine is a seasoned veteran who has fought cancer four times. Each time, he’s beaten the enemy back with an improving arsenal of chemotherapy concoctions he irreverently dubs “Mountain Dew” and “Hawaiian Punch,” according to their colors. Somewhere along the way, Devine stopped obsessing about dying, and gave up trying to predict when death would come. “My time card can be punched any day, but that’s true of all of us. I decided that only God knows when I’m going to die. In the meantime, he must have a plan for me.”With a new sense of purpose, Devine volunteered with the American Cancer Society and the Great Lakes Cancer Institute. He was featured in a McLaren Regional Medical Center commercial about cancer treatment. In 1999, his activities were put on hold when he received a bone marrow transplant, courtesy of a sister who was a near-perfect match. Treatments to prepare him for the transplant left him so weak that it took him four hours to take a shower. He suffered bouts of depression and anxiety. He developed an immune suppression disease that has left him with chronic pain and the loss of pigment in his skin and hair. Feeling better by the month, Devine knows he is living proof that cancer, even if it strikes repeatedly, does not have to mean imminent death. He has been free of the disease for seven years – his longest remission since his original diagnosis 16 years ago. He has lived to see his young daughter become a grown woman. In July, he and Donna will celebrate their 22nd wedding anniversary. Devine dreams of someday bouncing a grandchild on his knee. He wants to take Donna on a vacation to Hawaii. He’d like to start a new support group for cancer survivors and their families, and is ready to resume his public speaking. Like all good soldiers, Devine knows that the enemy is stubborn and can return at any time. But he also knows its weaknesses. What it can do is teach you the value of life. “I enjoy each day,” Devine said.